Growing up on the north shore of Lake Superior, Dr. Amy Downing has always been fascinated by the beauty and complexity of water and nature. These passions led her to pursue her bachelor’s degree in biology at Lawrence University and her PhD from the University of Chicago with a focus on the ecology and conservation of freshwater and marine ecosystems. Dr. Downing’s research explores the role of biodiversity for the functioning and stability of ecosystems, using freshwater ponds as a model ecosystem. Her work has received support from the National Science Foundation and has resulted in over 20 scientific papers, including some in top tier scientific journals such as Science andNature. Dr. Downing enjoys teaching courses such as Marine Biology and Conservation Biology and has traveled with her students to places such as the ponds of Michigan, the coasts of North Carolina and the Duke Marine Laboratory, the glaciers of Alaska, the mountains and rainforests of Ecuador, the land and waters of the Galapagos Islands, and the coral reefs of the Caribbean. In 2007 she won the Sherwood Dodge Shankland Award for the Encouragement of Teachers. When she is not teaching or doing research, Dr. Amy Downing enjoys spending time with her husband and two daughters who also share her passion for nature and the outdoors. Dr. Downing is primarily responsible for building and managing the Honors curriculum, consisting primarily of freshmen Honors Tutorials and Honors Courses. She communicates with students and faculty about current offerings in the curriculum and encourages students to engage with the Honors curriculum. 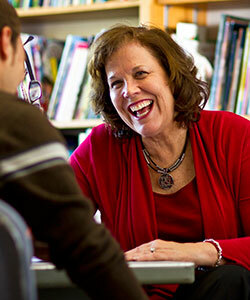 She helps students understand and complete the requirements to graduate with Department Honors or University Honors. Books have been Dr. McClure’s passion her entire life. She was one of those kids who devoured books and often stayed up all night reading under the covers with a flashlight. As children, she and her sister organized their extensive book collection into a lending library for other children in the neighborhood. She grew up to become an Honors student and history major at Ohio Wesleyan, where she was elected to Phi Beta Kappa, Mortar Board, and Phi Alpha Theta. She also served as president of Panhellenic Council. Dr. McClure earned master’s degrees from Emory and Ohio State Universities. She then returned to her true passion—books—and earned a Ph.D. in Children’s Literature from Ohio State. Now she gets paid to do what she loves. Dr. McClure taught in elementary and preschools as a teacher, reading specialist, and coordinator of gifted education. She currently serves as Rodefer Professor of Education and chairs the Education Department. She has published seven books in the field of children’s literature, written many book chapters and articles, and served as President of the Children’s Literature Assembly, the Children’s Literature and Reading Special Interest Group of the International Reading Association, the Ohio Reading Teachers, and the Ohio Association of Colleges for teacher Education. She received Ohio Wesleyan’s Herbert Welch Meritorious Teaching Award in 1998, the Outstanding College Teaching Award in 2001 from the Ohio Council of Teachers of English Language Arts, and the 1986 Outstanding Dissertation Award from the National Council of Teachers of English. She was also elected to the 2012 Newbery Medal Committee, which selects the most distinguished children’s book published in a particular year. In her free time, Dr. McClure reads children’s books and enjoys outdoor activities with husband and two daughters. Dr. McClure’s principal focus within the Honors Board is on student recruiting and activities. Thus, she works with the OWU Admissions Office to recruit new Honors students. She also advises the Student Honors Board and oversees Welch Dorm and the Honors House. Additionally, she works with Dr. Downing to develop the Honors academic program and create new programs and initiatives for Honors students. I am very honored to serve as one of the co-directors of the Honors Program. I have been teaching East Asian Literature and Film in the Comparative Literature Department at Ohio Wesleyan University since 2006. I am chair of the Comparative Literature Department as well as a faculty member in both the Women and Gender Studies and the East Asian Studies programs. My field of specialty is Japanese literature, but my research extends beyond Japan to Taiwan and China. I speak and read Japanese and have a basic knowledge of Chinese. I used to speak Moroccan Arabic as a result of living in Morocco for two years as a Peace Corps volunteer where I taught high school English. My education has been rather eclectic. I graduated with high honors from the University of Michigan with a B.A. in Psychology. I got a Masters Degree in International Education from Harvard University, and my Ph.D. from U.C. Berkeley is in Japanese literature with a sub-specialty in Women and Gender Studies. My first book From New Woman Writer to Socialist: The Life and Selected Writings of Tamura Toshiko from 1936-1938 (Brill, 2015) is about one of Japan’s most famous, if not scandalous, women writers. I am currently working on two projects. One focuses on Taiwanese colonial literature. The other is a biography of my grandfather, George E. Sokolsky, who was a journalist in China during the turbulent decades of the 1920s and 1930s. My research time during the summer months is now spent at the Hoover Institution at Stanford University, where 390 boxes of my grandfather’s papers are stored. Aside from my book, my scholarship has also been published in The U.S.- Japan Women’s Journal, Japan Studies Association Journal, Asian Theatre Journal and The Japan Review. I also have book chapters in anthologies published by Columbia University and Oxford University Press. At Ohio Wesleyan University, I have taught two freshmen honors tutorials (“Bad Girls: The Making of the Femme Fatale in Japanese Literature” and “Literature of the Silk Road”). Both of these tutorials reflect my own research interests in East Asia. In the future, I would like to teach a tutorial on Japanese literature and environmentalism. I also teach two honors classes (“Freedom and Constraint” and “Love and Sexuality in East Asian Literature”). Outside of the Honors program, I teach courses about all of East Asia (China, Taiwan, Korea, and Japan), pre-modern and modern, as well as thematic courses that focus on gender theory, race and identity politics, eco-literary criticism, and translation theory. I have been the recipient of several academic fellowships including a Fulbright-Hayes Doctoral Dissertation Fellowship to finance a year of research in Japan when I was a graduate student. More recently, I was awarded a Mellon Foundation Grant to participate in a faculty study trip to Korea and a grant from Taiwan’s Ministry of Education to support archival research at Academia Sinica and Taiwan’s National Library. As a result, I am very familiar with writing fellowship applications and I am eager to share what I have learned about the application process with Ohio Wesleyan students.